You don’t have to be an award winning, world renowned speaker to experience all the ways speaking can grow your business. For both new and seasoned small business owners, speaking can significantly increase your income, visibility and impact. In my previous post – Ways To Grow Your Business With Speaking, I shared three ways you can make money speaking. 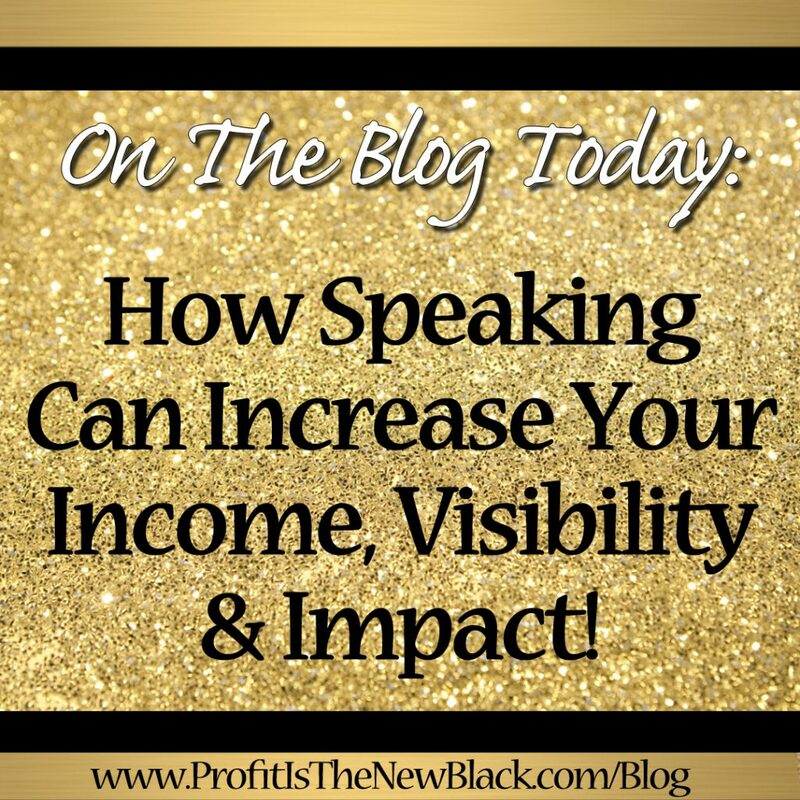 In this post, I’m going to focus on how one speaking engagement can generate income and new clients beyond the time you’re actually in front of the room speaking. Let’s say you’re not compensated to speak but you can make a free or paid offer during an event. You make a paid offer and some of the attendees become clients. Those new clients continue to buy various products and services from you for some time. At the same time, one of the event attendees passes your information on to another event host and you’re invited to speak for fee. And once again, the income from one free speaking engagement continues to fill your bank account. The example presented above doesn’t just happen, you have to be strategic about how you use speaking to grow your business. How long are you being asked to present? Are you being compensated as a speaker for the event? If you are, will you be able to sell your products and services? If not, will you be able to make a free offer so you can follow up with the attendees? For example, can you offer a complimentary consultation or free gift to build your email list? If you’re not being compensated, what are you being offered in exchange for your time? Will you be able to sell your products and services during your talk? If so, is there a limit on the price of the product or service you can offer? Is there a revenue share between you and the event host? Will you get a table to showcase your products and services during the event? Will you be able to make a free offer so you can follow up with the attendees? For example, can you offer a complimentary consultation or free gift to build your email list? How will speaking at this event impact your brand and your business? As you can see there are many elements to consider when using speaking as a business building strategy. By now, I’m guessing you’ve already started searching for places to speak. Why? Because you’re in business to make money. Right? At least, I hope so! Would you like to discuss how to create a customized speaking strategy to grow your business and increase your profits? If you answered yes, click here to book a complimentary profit boosting session today!